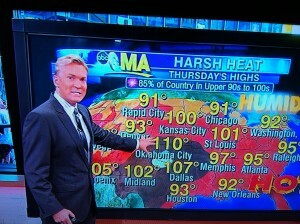 Sam Champion, the weatherman on ABC, must be colorblind. That, or he simply doesn’t care about his viewers. Why does Midland, Texas, with a paltry 102 degrees, deserve to be colored deep red on the Good Morning America weather map, when Arizona, with its 111+ temps for weeks on end, is only pink? All summer long, we’ve suffered the same mistreatment. There he stands, going on and on and on about the heat wave in the Midwest—the blistering temps, the drought conditions and warnings of heat exhaustion in Texas and Oklahoma, with never a word about Arizona. Hey, Sam! It gets that hot every day in my zip code. Last night, Scottsdale was 108 degrees at midnight. Arizona can have a weeklong cold spell and still be hotter than Midland. And Houston? Who cares? Look at him up there, trying to hide Phoenix. I suppose he thinks it’s a dry heat, that we’re used to those temperatures—that triple-digits in the desert aren’t newsworthy. Well, I’m not going to take it anymore. Arizona deserves recognition of its hell-like conditions—its dust storms and yearlong droughts, its monsoons and raging haboobs and daytime temperatures hot enough to melt lead. I put a call in to our local news station, demanding that they do something. They’re an ABC affiliate—surely they’d have some pull with this quack. Did I stutter? “Yes, you guys have to do something about the weather report on GMA. It’s completely unfair.” Boy, I was really steamed. “Just a minute, sir.” Right before she put me on hold, I heard something like, Hey you guys, we got another one. I guess I wasn’t the only person who was mad at Sam Champion. “Yes, I’m a meteorologist.” She seemed offended that I wasn’t using her official job title. I explained to her how Sam Champion was snubbing Arizona, that he was giving those wimpy Texans all the weather attention. 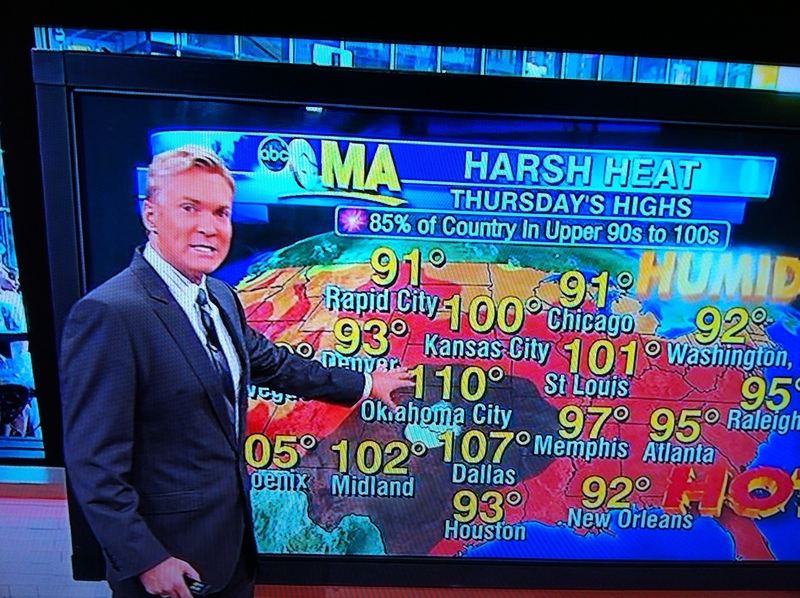 If it were up to Sam Champion, Arizona could burst into flames—he’d never say a word about us. “Yes?” There was a sick feeling in my stomach. “Please don’t refer to me and Sam as weatherpeople. We’re meteorologists.” And she hung up the phone. "Let me tell you I am better acquainted with you for a long absence, as men are with themselves for a long affliction: absence does but hold off a friend, to make one see him the truer."